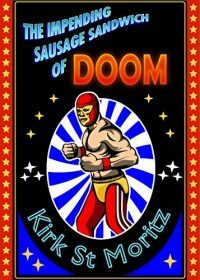 In The impending Sausage Sandwich of Doom by Kirk St. Moritz, Elliot Rose is the guy that makes the ghostly events happen on the television show Ghosthunters UK when he runs into a real ghost. Gordon Cole was Hapkito, a popular wrestler in the 1980s. Gordon thinks that his return is some higher elevation achieved but what’s really going on? The author gave me a copy of this novel in exchange for my review. Gordon Cole a.k.a. Hapkito would tell you that calling The impending Sausage Sandwich of Doom a paranormal novel would be an incorrect description. He would likely describe the work as a tale of the quest to the next level of reality. When Hapkito steps on the scene appearing to Elliot, he understands that he has achieved the enlightenment to which his wrestling character aspired and has somehow traveled in time. Gordon is a not so rain-man-like Serge Storms to Elliot’s less drug impacted Coleman and the duo is just a lot of fun to read. Elliot is an assistant on the show Ghostbusters UK when we meet him. His job is to create the paranormal events off-screen to tantalize the audience. I would be very surprised if the fictional show isn’t a send-up of the long-running UK ghost hunting show, Most Haunted. Medium Jeremy Flashman’s method sent me into peals of laughter as it reminded me of famed teen psychic Tyler Henry’s method of repeating “That’s so weird” while digging for connective hints on which to elaborate and shock his celebrity clients. Moritz’s mastery of setting the scene continues as readers flash back to the past to watch Gordon interact with his mother and then head off to his secret and his ill-fated job as superstar wrestling giant. There’s a beautiful authenticity in the near Monty-Python-ridiculousness of a piece at times. Moritz fully lays out his delightfully flawed characters, giving us a sense of what to expect as they proceed through the story. The humor is very English but also somewhat slapstick when appropriate to the trajectory of the plot line. The old lady gang, led by Mrs. Clarkson, is filled with brash spirit and is just hilarious. Elliot is appropriately intimidated by them as he naturally would and likely by anyone threatening to put his personal parts through a meat grinder. These women could go to an ugly central casting place very easily but the skill with which they’re written is both authentic and way over the top. They’re bullies, they take what they want and yet they want is to connect with what they’ve lost, which gives them dimension and humanity. The scene in which Elliot, the hapless foil, is called upon to find out what happened to Cole’s mother after his passing is side-splitting, but also contains a layering of emotion that draws the reader into the work and fosters a need to know what happens next. St. Moritz’s writing style is very practiced and fluid. There were absolutely no errors in The impending Sausage Sandwich of Doom and I believe the copy sent was an advanced reader’s copy (ARC). St. Moritz’s turn of phrase reads as an author very able to self-edit and boil a sentence down to its point of greatest impact. When I reviewed St. Moritz’s first book, The Day Jesus Rode into Croyden, I suggested that it might not be a book one’s 66-year-old father would enjoy. The impending Sausage Sandwich of Doom is a different proposition. I think my now 71-year-old father will find it hilarious. Also, this reader can attest to the fact that both books are excellent to read when sick as, coincidentally, I had vicious colds while reading both and was wracked with wheezy laughter. If you’re enjoying the holiday weekend and want a fun read, pick The impending Sausage Sandwich of Doom up today. Kirk St. Moritz is a Guernsey-based author. The Day Jesus Rode Into Croydon is his first novel. You can read a review here. For more information Kirk St. Moritz and his work, visit his Amazon page. You can connect with him on Goodreads and Twitter @KirkStMoritz1.